So, I started and finished Magic Study in one night. That alone says SO much about how I feel about the book. There aren’t many books that I get so into that I finish them in one sitting, and I really wasn’t planning on doing it with this book but I fell so very much in love with the story, once again. 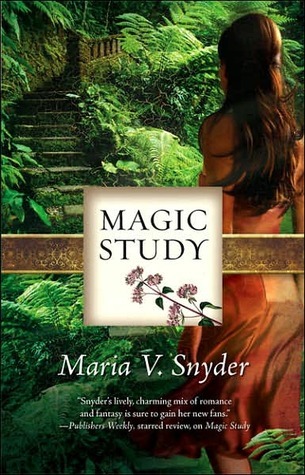 Magic Study was an amazing follow up to Poison Study and yet again, I’m so thankful for Lauren telling me about this series. In book two, Yelena has traveled to Sitia with Irys to meet the family she was kidnapped from so many years ago. I must say that her family and the Zaltana Clan… they’re all very eccentric. No other way to describe them. I love how much love they have for Yelena after all the years she was apart from them, and how welcoming her parents are. After meeting the family she’s forgotten over the years, Yelena heads to the Academy so that Irys can teach her how to manage her magic. She of course encounters trouble along the way, and once she gets there it just keeps coming. The only thing I didn’t like about it was that Valek wasn’t around for most of the book. It made me SO happy to finally see him when he did show up but it just wasn’t enough. I am a huge Valek fan and it was disappointing to not have him there for Yelena. The whole storyline started to get a little overdone with how much she was put through (beaten up, magicians trying to access her mind, etc. ), but I really didn’t mind. Everything kept very true to the Study Series and to Yelena’s character – trouble seems to follow her everywhere but she does her best to help combat it. I rated it 5/5 on Goodreads even though there were a couple of things I didn’t like, mostly because I love the world the series takes place in and the writing is brilliant. Maria V. Snyder is a genius in my book. Thank you! Glad to hear of someone else that loves it as much as Lauren & I do!